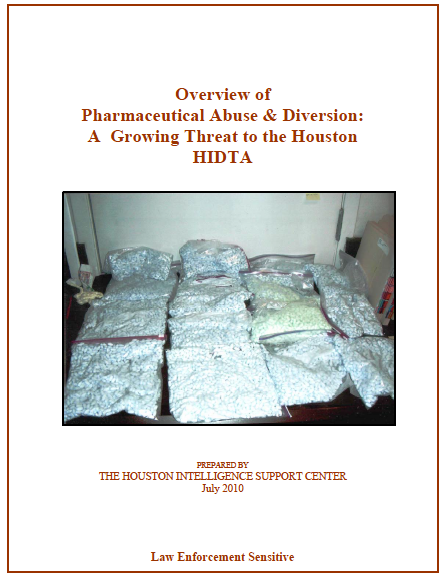 The threat of pharmaceutical drug abuse and diversion in the Houston HIDTA has been dangerously high and increasing for the past several years. Drug investigators report that it is becoming more widespread, addicting abusers from middle school to middle age. Perhaps the most concerning threat related to pharmaceutical abuse is the alarmingly high potential for overdose or accidental death from controlled prescription drugs. In Harris County alone, from 2006 through 2008 pharmaceuticals were present in over 66% of the 1533 cases of toxicity-related deaths. In 2009, over 78% involved pharmaceuticals. Not only is diversion a deadly problem, it is incredibly profitable. Pain management clinic owners gross an average of $4,000-$5,000 per day at each location. A successful owner running multiple clinics can easily make $75,000 a week from only three operations, getting paid entirely in cash. Diversion of pharmaceutical drugs continues to be a present and growing threat in the Houston HIDTA. The practice of “doctor shopping” to obtain mass quantities of pharmaceutical pills for illicit use continues unabatedly and legally. “Doctor shopping” is defined by drug investigators as the practice of going to multiple health care professionals in an effort to obtain numerous prescriptions for the same drugs. There are currently no state laws in Texas prohibiting this practice. Consequently, criminals have used the lack of legislation to their advantage, amassing enormous amounts of controlled prescription drugs, such as hydrocodone, alprazolam and carisoprodol to sell for illicit use. Use of pain management clinics is the predominant method of pharmaceutical diversion within the Houston area and exploitation is extensive. Use of pain management clinics for diversion schemes is widespread in the Houston area. Drug investigators have identified at least 150 pain management clinics connected to diversion activities in Harris County. Drug dealers have organized prescription drug rings to go to these clinics in order to obtain large amounts of medication quickly. Due to high demand for these drugs, criminals have found that engaging in diversion is quite lucrative, and this is an impetus for their continued involvement in this illicit activity. The problem is widespread throughout the Houston HIDTA. However, diversion using pain management clinics and prescription rings presents the greatest threat in the northern counties. Pharmaceutical drugs are prevalent and lethal. Most law enforcement agencies within the Houston HIDTA reported a high level of availability of controlled prescription drugs in their communities. Not only do the majority of surveyed law enforcement personnel throughout the region indicate that availability of prescription drugs is high, agencies in 15 out of the 17 Houston HIDTA counties reported an increase in availability of diverted pharmaceuticals in 2009. The “Pharmaceutical Cocktail,” a common trio of medications prescribed at pain management clinics, is the single leading cause of toxicity-related deaths in Harris County. This cocktail consists of hydrocodone, alprazolam and carisoprodol. Law enforcement is hindered by a lack of laws criminalizing diversion. The general consensus among drug investigators is that the diversion problem must be addressed through changes in legislation. Unlike drugs such as cocaine or marijuana, possession of prescription drugs is not inherently illegal. It may be obvious that a person found with multiple bottles of hydrocodone is involved in diversion and/or drug abuse. However, technically, no crime has been committed if each of the bottles is labeled with that individual’s name. Laws must be changed so that law enforcement can better respond to the growing threat of pharmaceutical diversion in Texas. Most importantly, passing a law outlawing “doctor shopping” is imperative. The level of pharmaceutical abuse in the Houston HIDTA is unknown. While seizures, deaths, and arrests can all be measured, these are only the visible results of prescription drug abuse and not inclusive of the amount that goes undetected. Little is known regarding the level of diversion from online pharmacies. They are usually operated from other countries and offer a high level of anonymity to clients. Although this does not constitute as imminent of a threat as drug rings and pain management clinics, there is potential for this to become a more exploited method of procurement, especially if “doctor shopping” is outlawed in the future. If legislation passes in the State of Texas, new methods of enforcement against diversion and abuse of pharmaceuticals will become available. How law enforcement and criminals will adapt to these changes remains unknown.